Trinity Lutheran Church, decorated with ferns from my friend, Mike, and with hydrangea pew flowers by my floral designer sister, Lanae Feser of Waseca Floral. 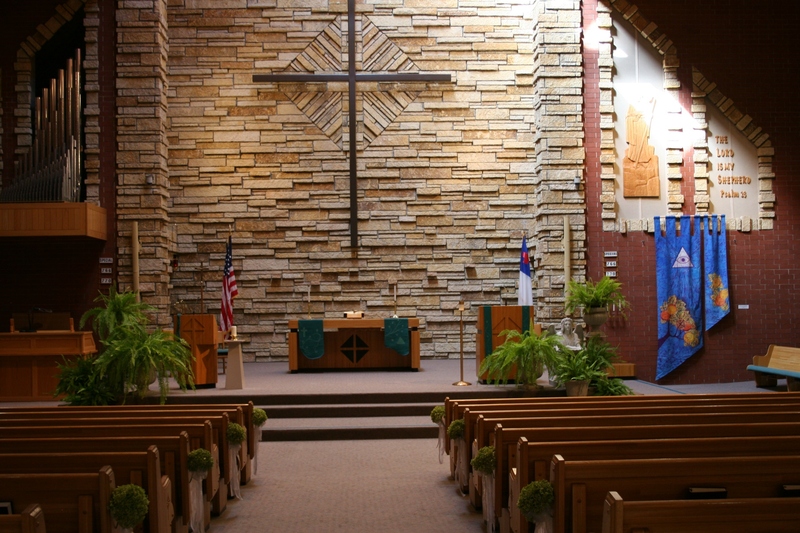 Trinity is our family’s church, where the bride was baptized and confirmed and attended Faribault Lutheran School. LOVE. GOD’S LOVE. The young couple’s love for one another. Love brought family and friends together at 4 p.m. Sunday, September 22, at Trinity Lutheran Church in Faribault, Minnesota, to witness the marriage of my daughter, Amber, and her now husband, Marc. I love that they chose Sunday as their wedding day, although I know not all invited guests were pleased. Amber and Marc. Photo by and courtesy of Minneapolis based Rochelle Louise Photography. 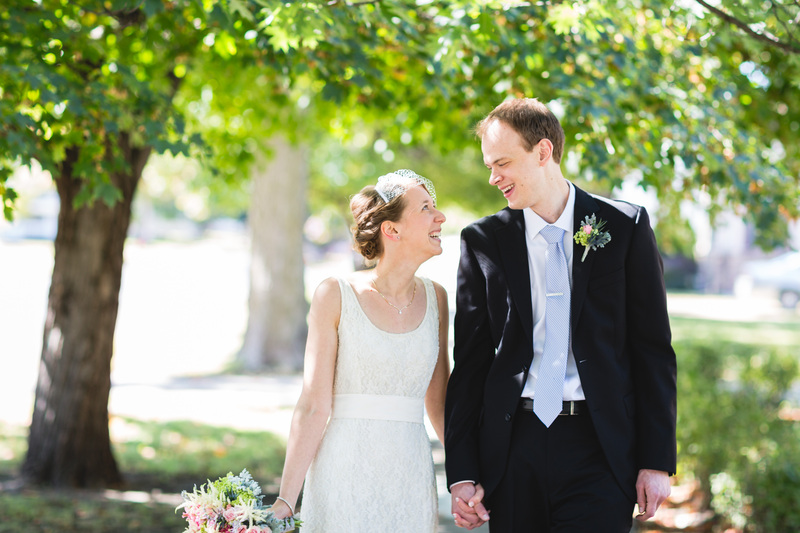 But Sunday, a day of rest, a day set aside for the Lord, seemed the perfect day for this couple to unite in marriage. Their faith has been an important part of their relationship from the beginning and will center their lives together. John 4:11 was among their chosen Scripture readings. 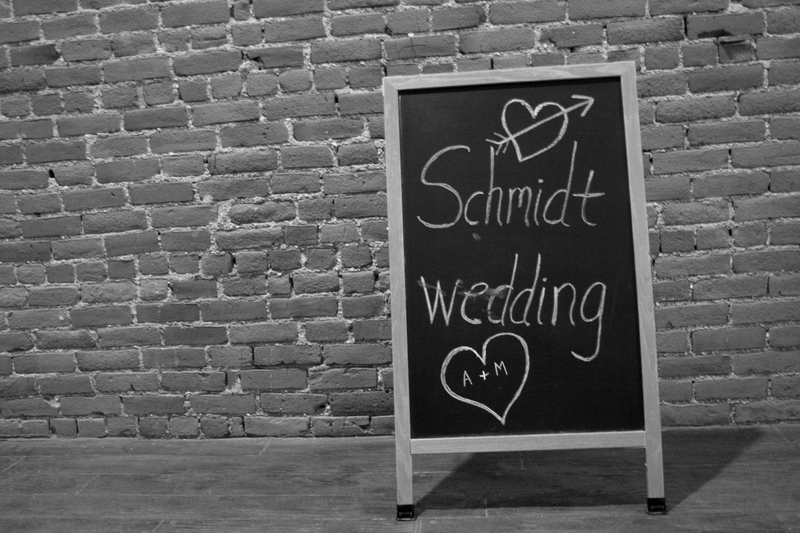 Mr. and Mrs. Schmidt are absolutely, incredibly, in love. Photo by and courtesy of Rochelle Louise Photography. They also chose, rather than to light a unity candle or pour sand from two containers into one, to share Communion. Just the two of them. The pastor noted in his message, how he appreciated this decision, how years ago Communion was a part of most Lutheran wedding services. 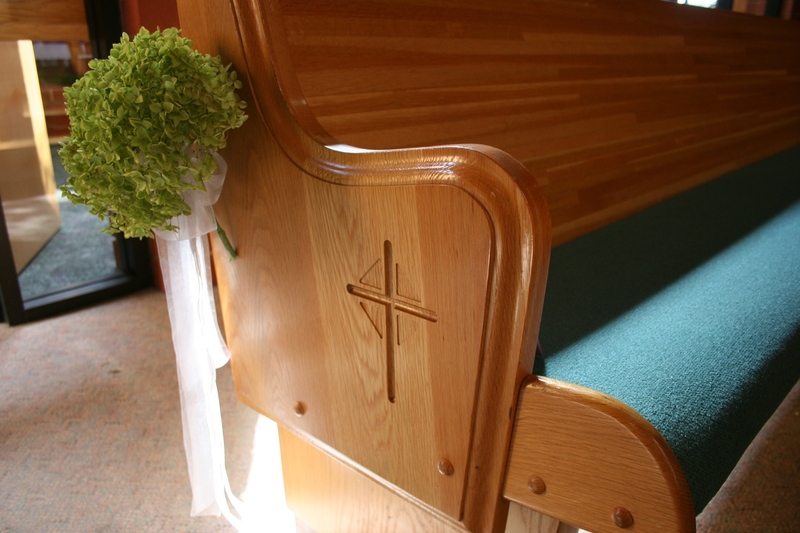 When the young couple partook of The Lord’s Supper together for the first time as husband and wife, tears edged into my eyes, just as they had earlier when my husband walked his daughter down the aisle. It was an emotional moment. And even though the mother-of-the-groom vowed that she would not cry—and she didn’t—I would not, could not, make that promise. For I knew I would never keep it. 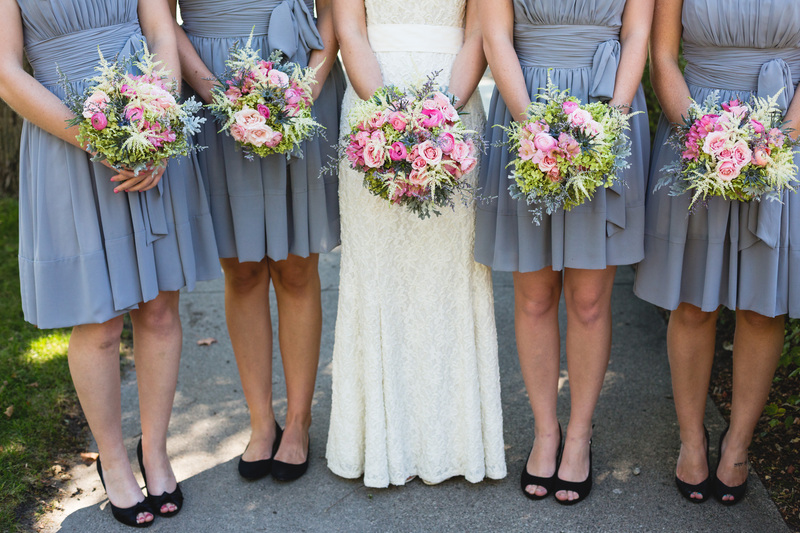 The bride and her attendants with the stunning bouquets created by my floral designer sister, Lanae Feser of Waseca Floral. Photo by and courtesy of Rochelle Louise Photography. The bridal party awaits the beginning of their photo shoot. 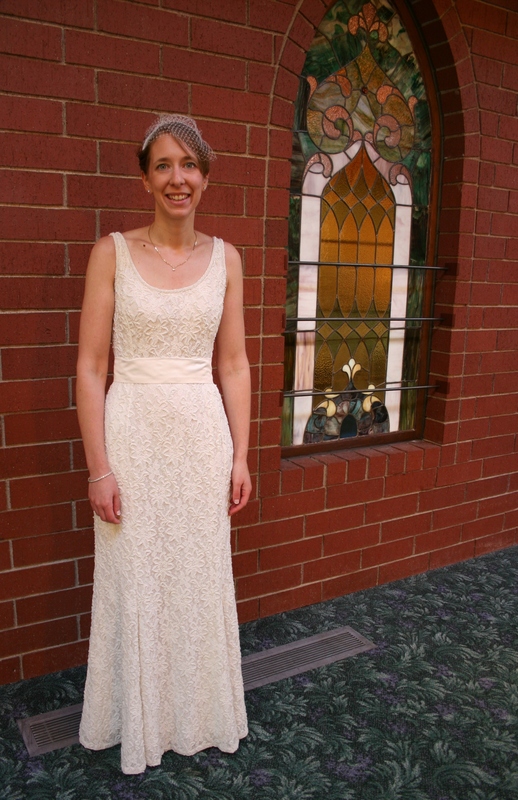 The second-hand bridal gown was purchased at Andrea’s Vintage Bridal in Minneapolis. 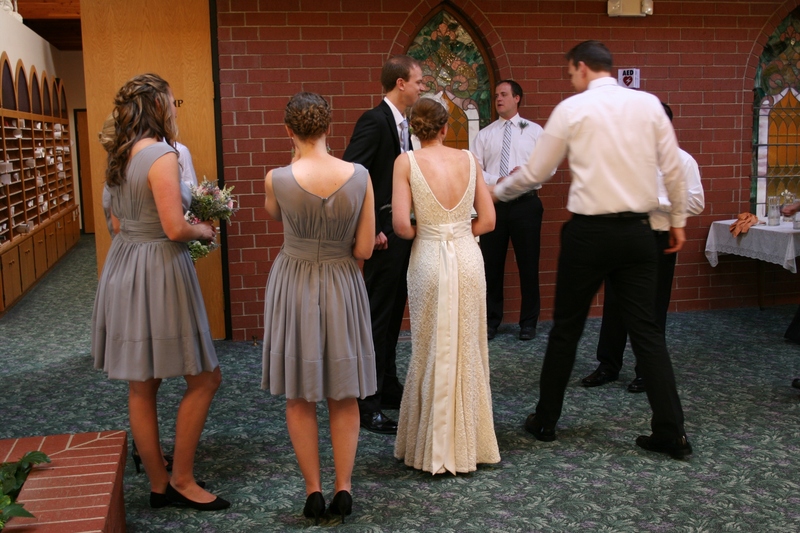 The bridesmaids’ dresses were custom made by dressmakers in Hong Kong (I think) and purchased through etsey. When my daughter tried on this beaded replica vintage dress, we all knew, just knew, it was the one for her. She had it taken in and a sash added with no other alterations. Sister of the bride and maid of honor, Miranda. A single hydrangea adorned every other pew. The wedding party heads outside for photos. No, I did not follow out of respect for the professional photographers and at the bridal couple’s request. It’s best to stay out of the way. Because of that, dear readers, I took no formal wedding couple/group shots. The flowers, oh, the flowers. 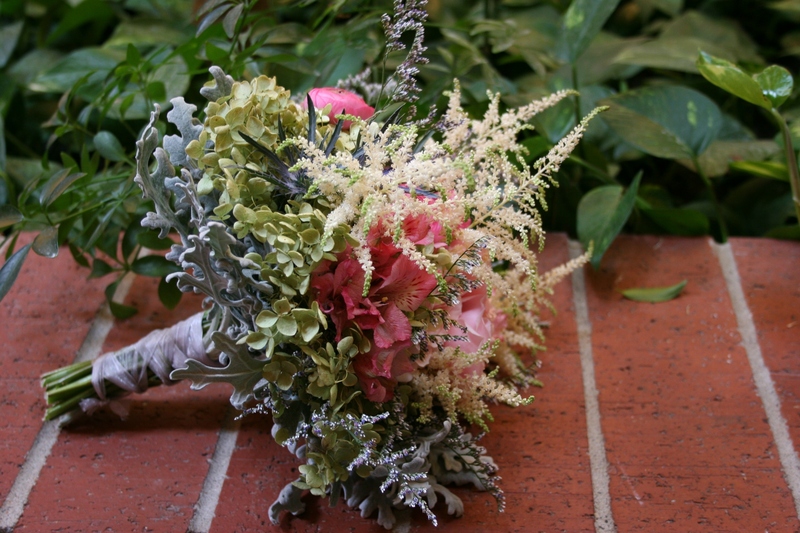 My beyond talented sister, Lanae of Waseca Floral, created the bouquets. FYI: Please click here to check out the work of Minneapolis based Rochelle Louise Photography. This husband-wife team set a serene mood for the photo sessions with their relaxed and confident attitudes. I cannot wait to see the remaining results of their nine hours covering Amber and Marc’s wedding. From this first glimpse of their work in three of the photos so credited above, I am beyond impressed. Thank you, Rochelle and Tom. When you click onto Rochelle’s website, also click onto her blog to view her take on Amber and Marc’s wedding and some of her favorite photos. 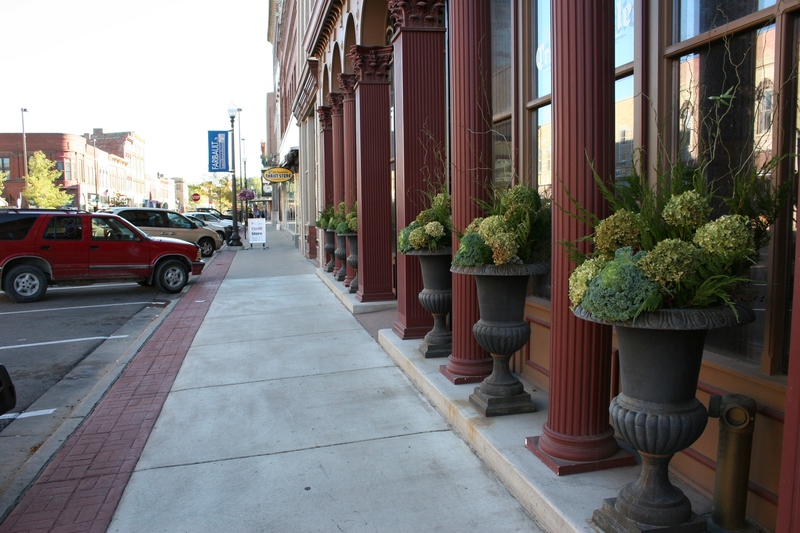 Click here to reach Waseca Floral, where my sister, Lanae Feser, works as head designer. 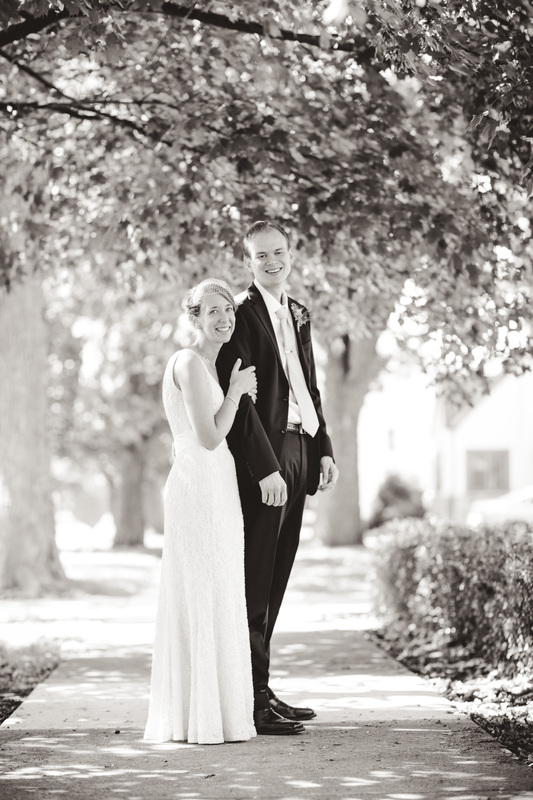 To learn more about Andrea’s Vintage Bridal in Minneapolis, click here. To view previous “My daughter’s wedding” posts, click here and then here and also here. Two more wedding posts will be forthcoming. 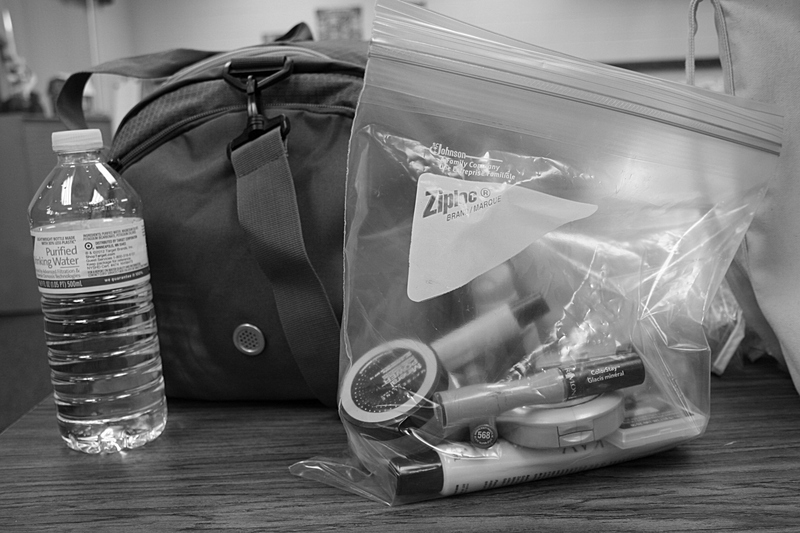 Photos by Rochelle Louise Photography are copyrighted and published here with permission. I AM 100 PERCENT German. 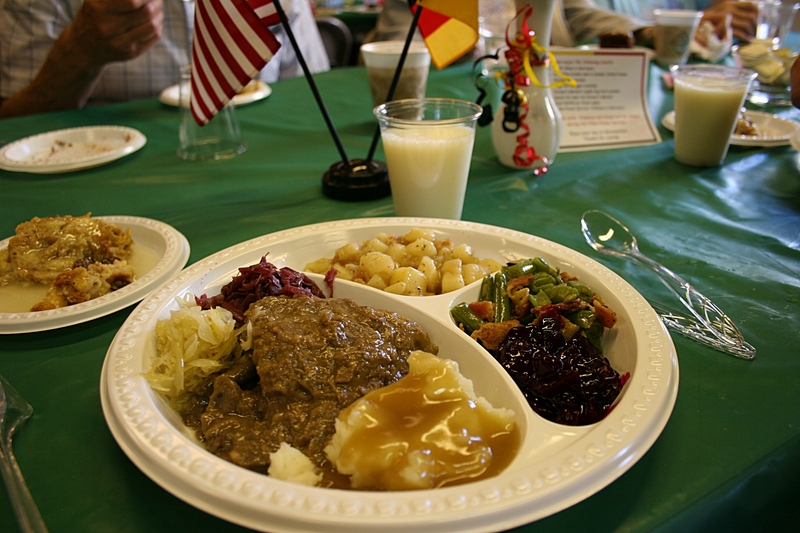 My plate, filled with German foods like sauerbraten, sauerkraut, German potato salad, sweet and sour beets and more at St. John’s annual Germanfest. Today was a gorgeous autumn day here in southeastern Minnesota, as glorious as they get. 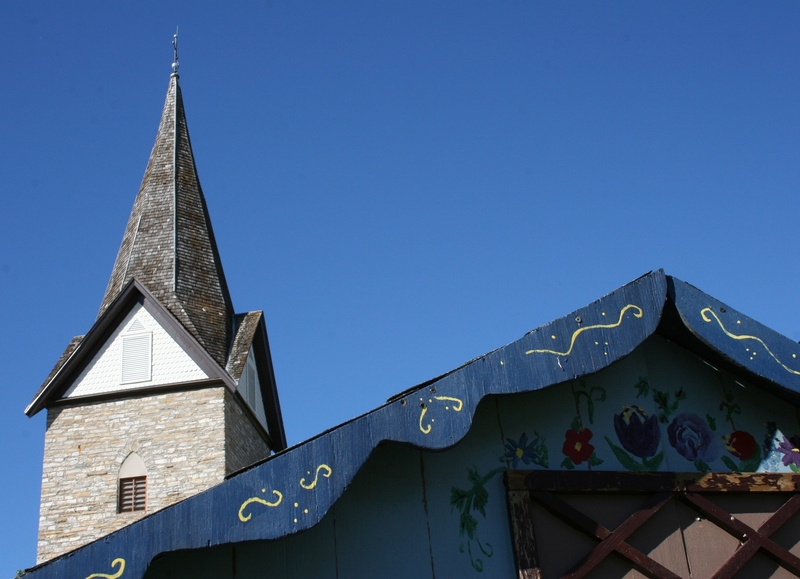 The steeple of the historic stone church with the roofline of a German themed beverage booth in the foreground. 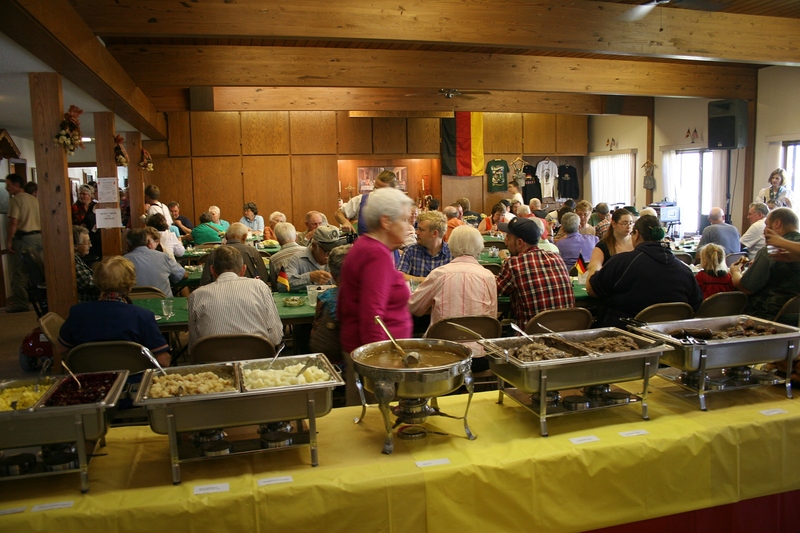 St. John’s United Church of Christ, Wheeling Township, rural Faribault, was hosting its annual Germanfest at its historic stone church out in the country. 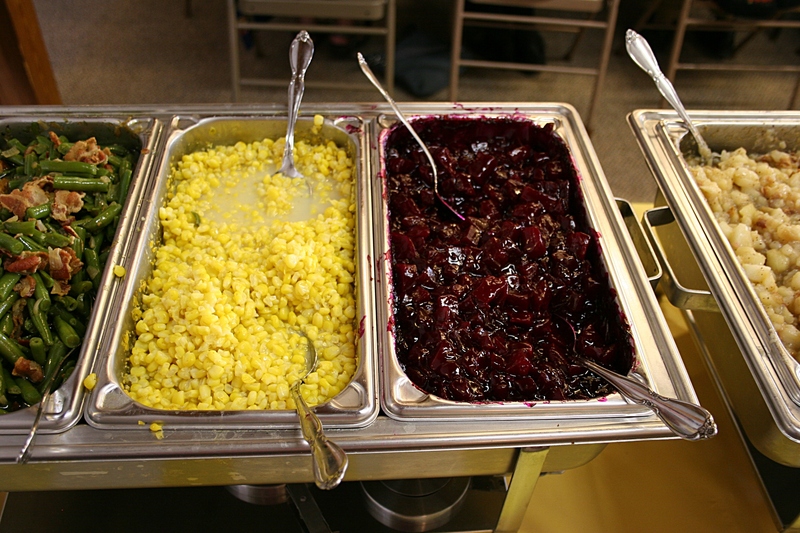 Just a snippet of the buffet line. The social hall and rooms off the dining area were filled with diners. And I couldn’t think of a better place to dine on this Sunday afternoon than at St. John’s. Great food in the company of wonderful folks. Out in the country. Perfect weather. Perfect day. 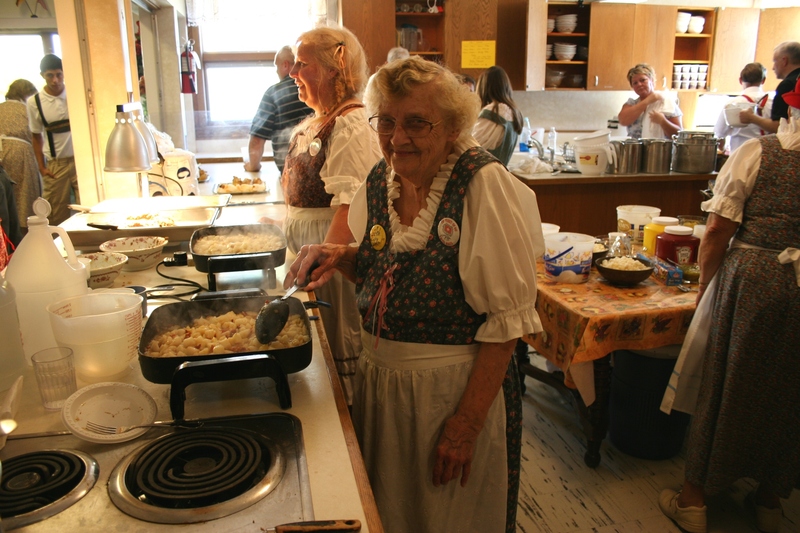 Some of the St. John’s kitchen crew, including long-time member Elsie Keller who is making German potato salad. 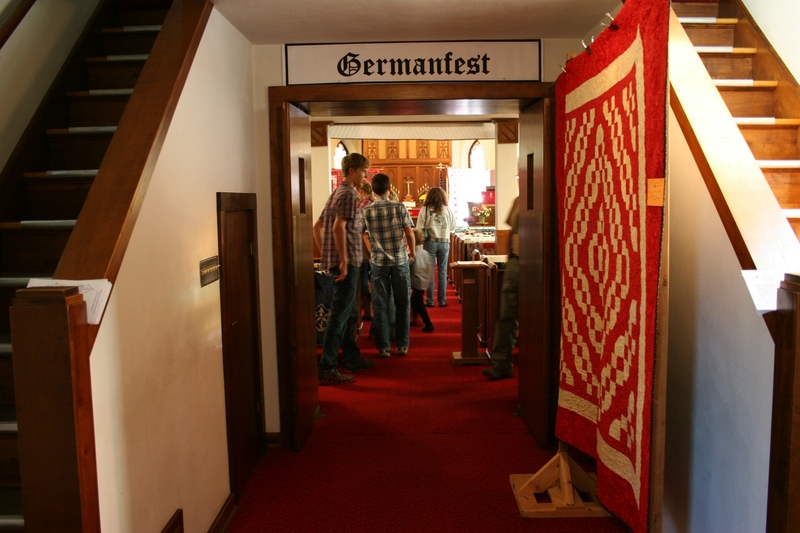 One of the major components of Germanfest is the fabulous quilt show inside the sanctuary. 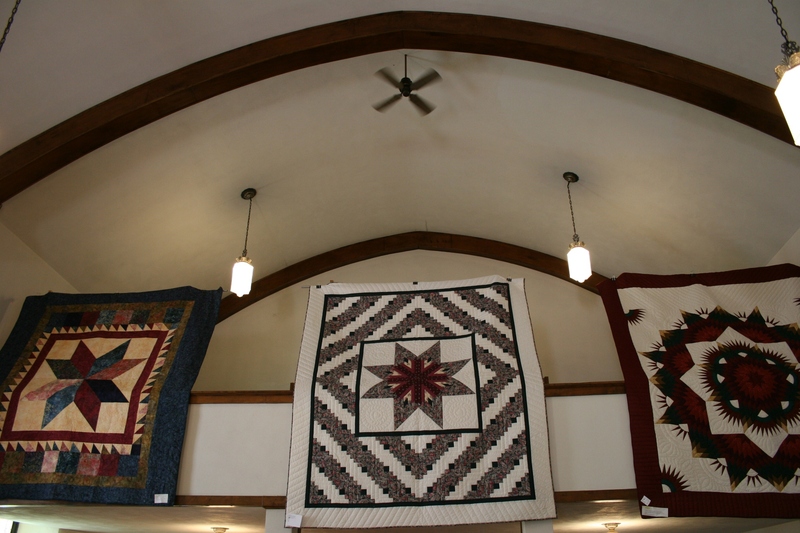 Among the incredible quilts were these three hung from the balcony. 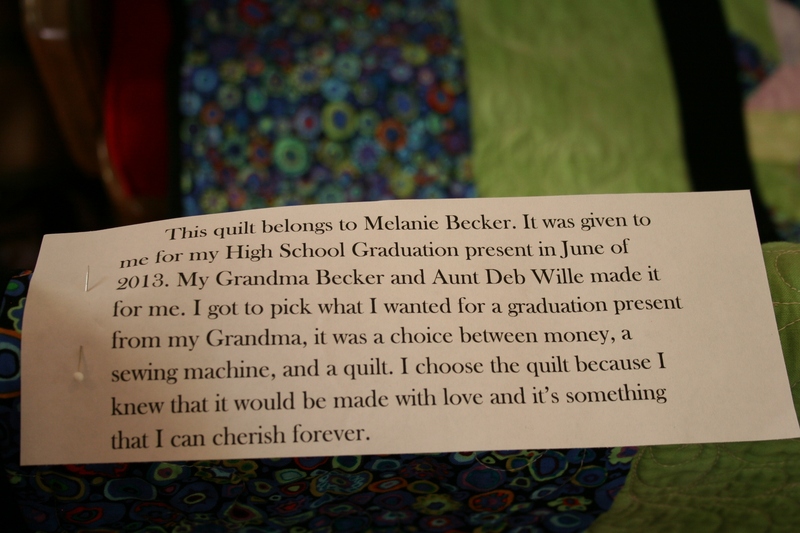 Each quilt comes with a story, this one among my favorites. That glorious quilt show. 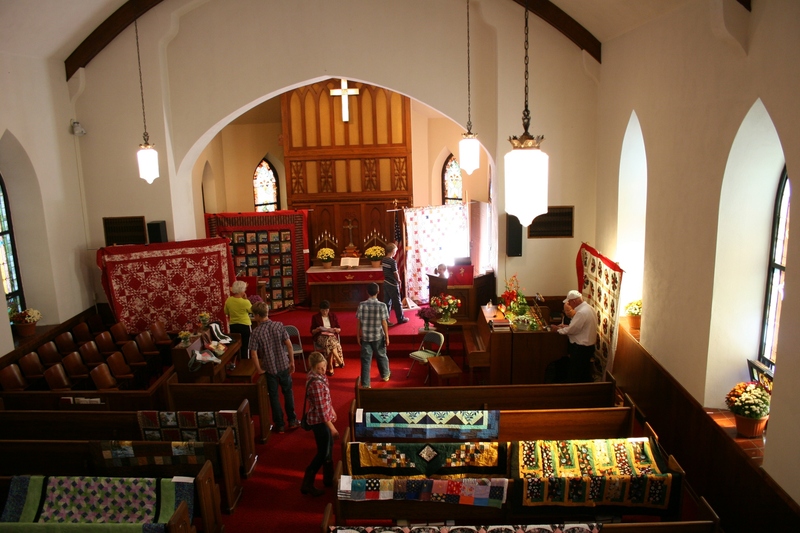 Here you are seeing only a snippet of the quilts draped over pews. 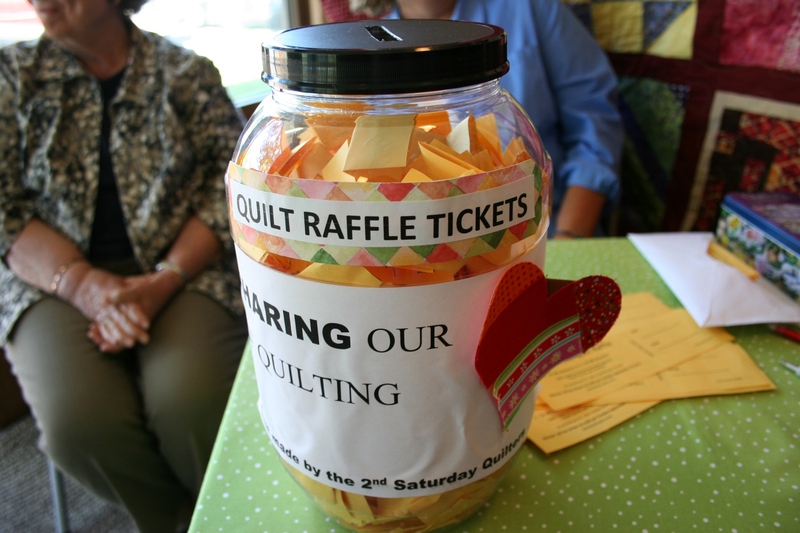 My husband and I each bought a quilt raffle ticket. 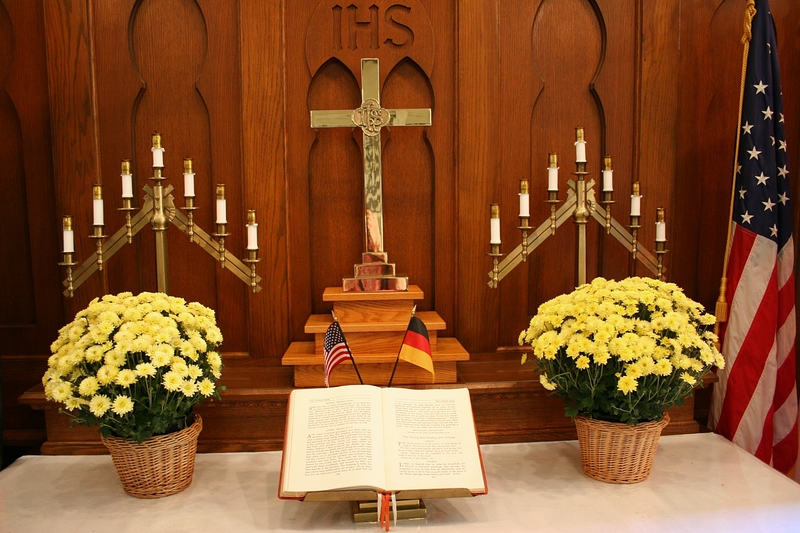 The beautifully-appointed altar, complete with German and American flags. 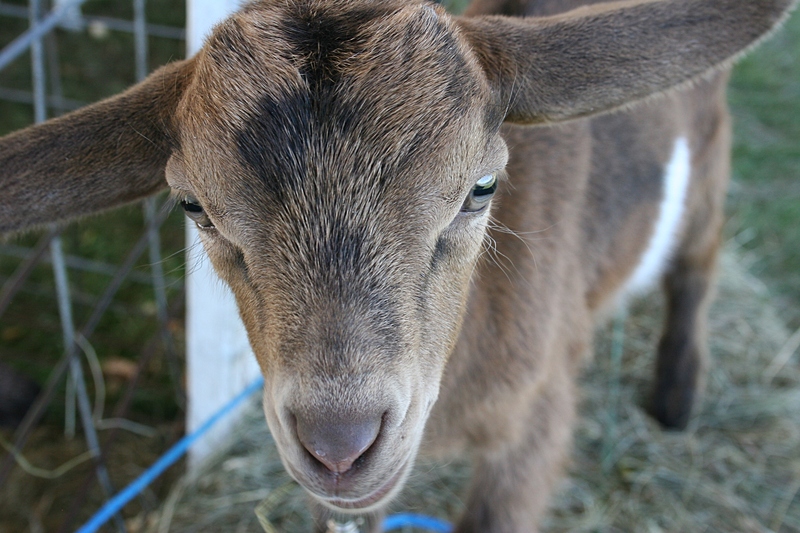 Outside the church, I fell in love with the adorable goats at the petting zoo. 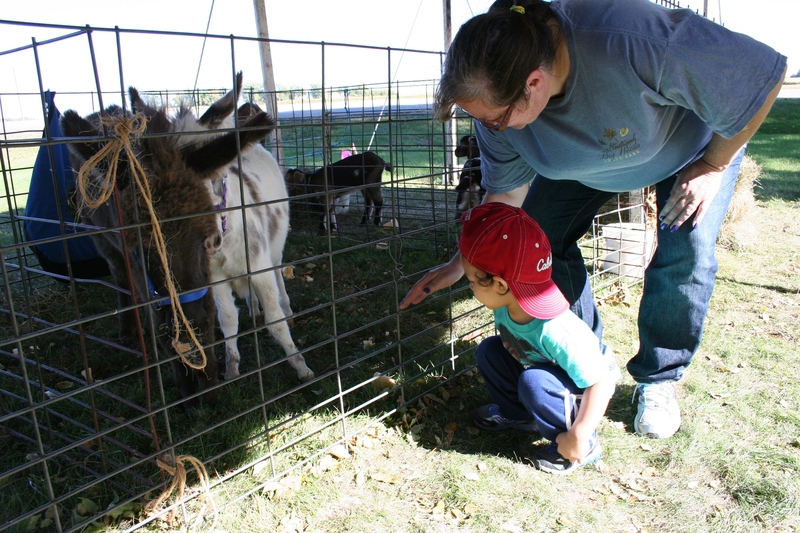 And this little guy loved the miniature donkeys. 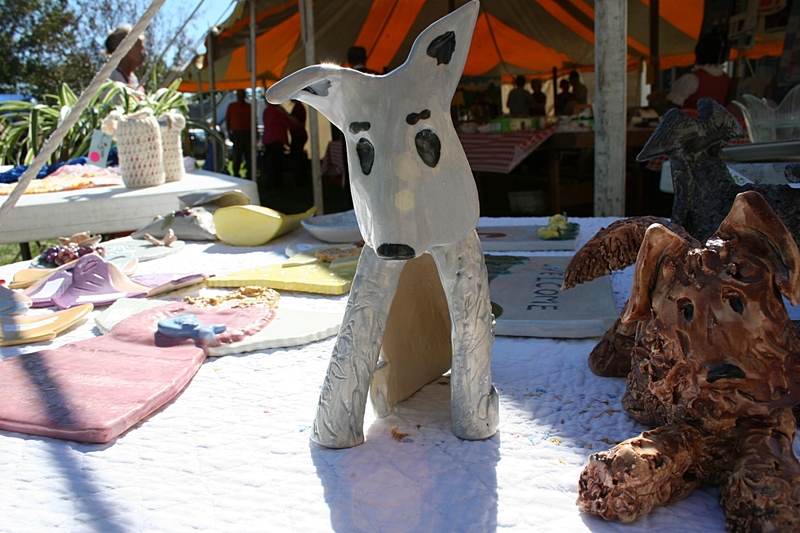 Along with fresh produce and baked goods and greeting cards (some published by Warner Press with verses I wrote) and apple jelly was this art (including these cute pooches). 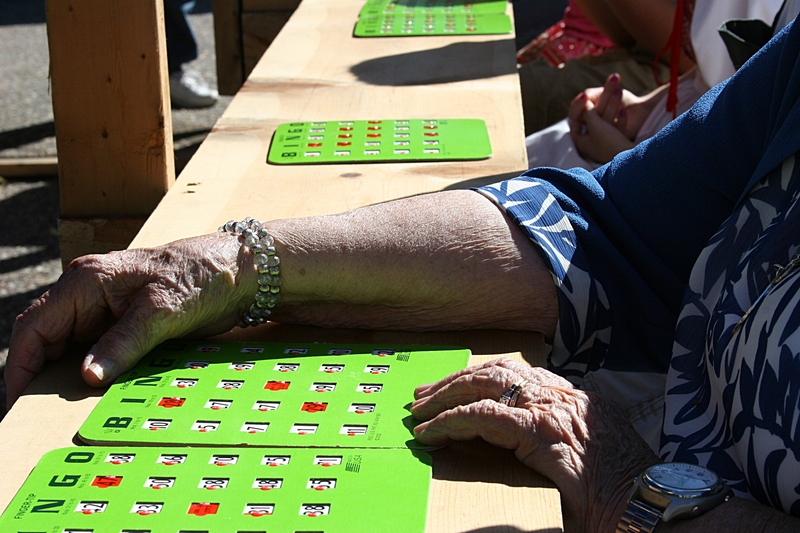 Bingo drew the young and the older. 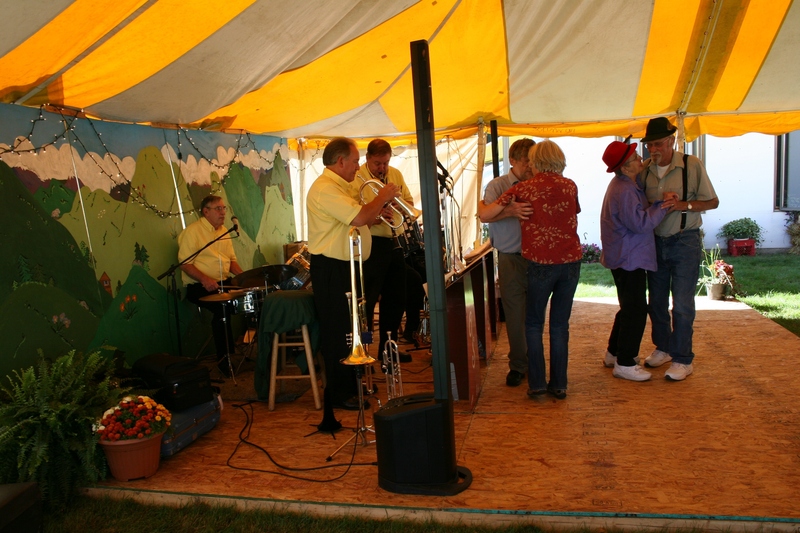 Old-time music drew dancers and listeners to the tent next to the church. ARRIVING AT TRINITY LUTHERAN CHURCH in Faribault prior to the appointed family photo time at my daughter’s wedding on Sunday, September 22, I managed to sneak in a few photos without intruding. I hope. Randy and I had come a bit earlier than we were supposed to be there. 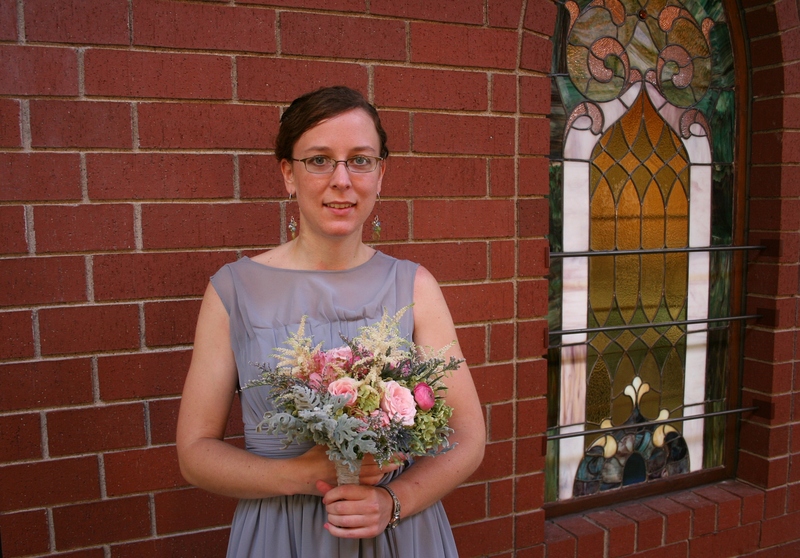 But I figured the parents could bend the rules ever so slightly as long as I stayed inside the church and did not follow the wedding party outdoors for the professional photo shoot. 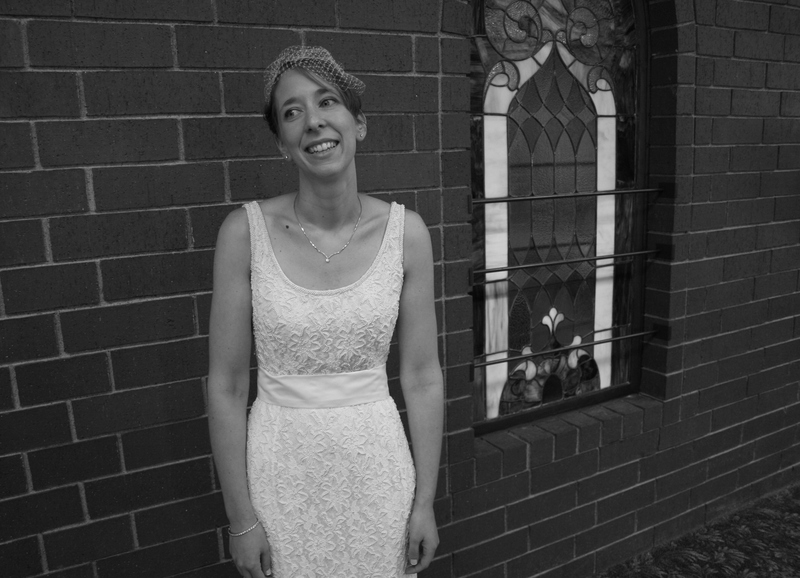 My daughter Amber, the bride. 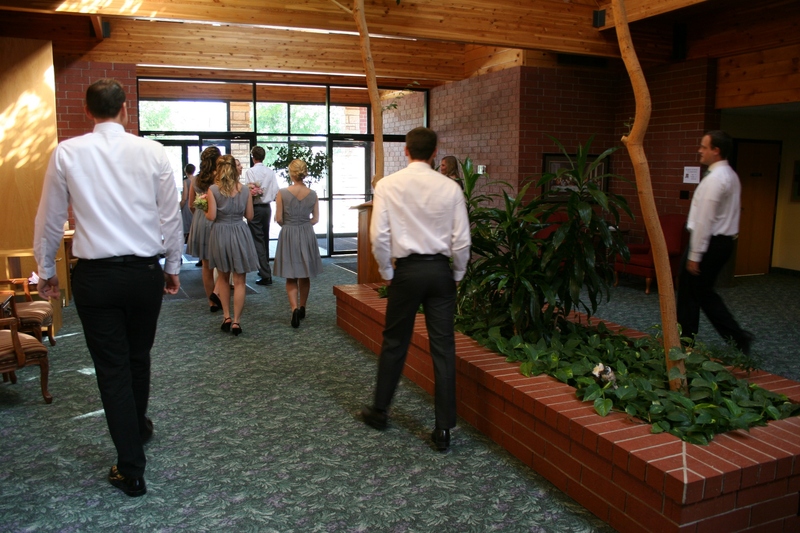 The bride lifts her dress as she walks through the narthex. Details inside the women’s dressing/prep room. 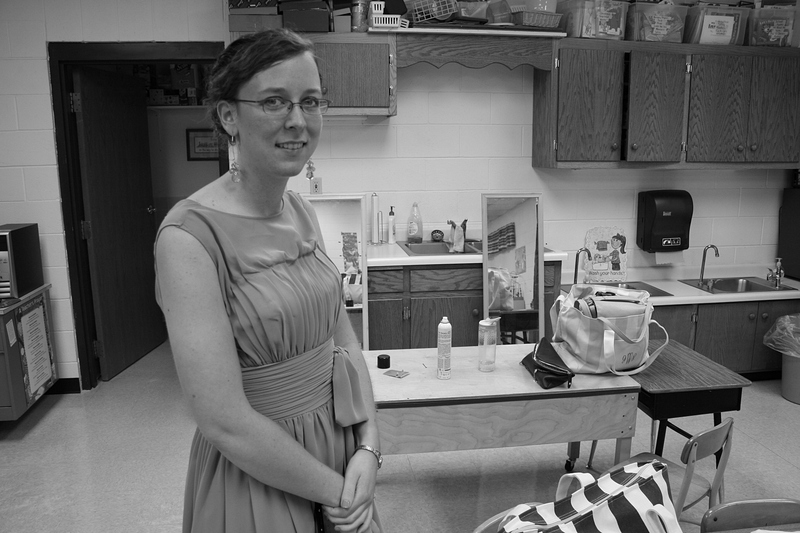 Miranda, the maid of honor, poses for a snapshot in the women’s dressing room. 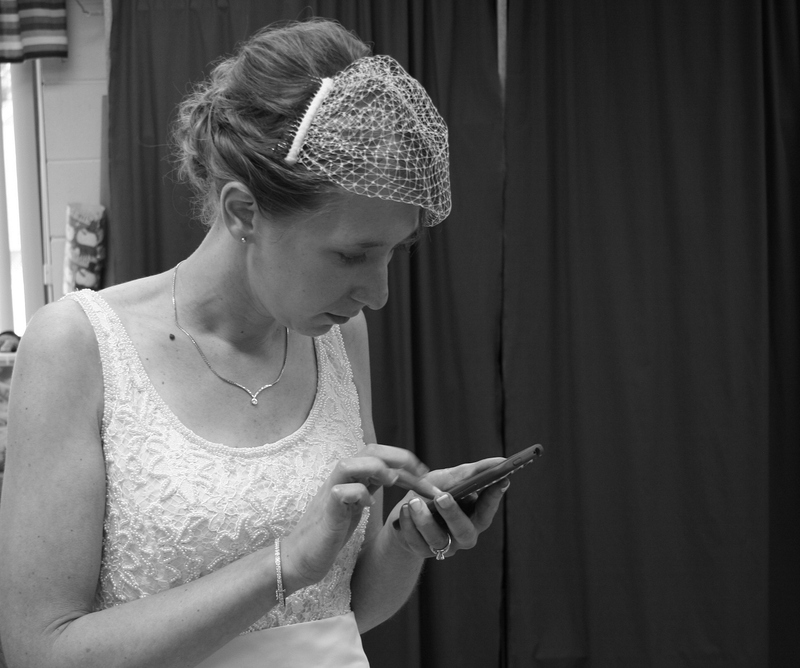 And back in the changing room, the bride uses her smart phone. On Monday I’ll bring you more images shot before the service, this time in color, including long-awaited (at least I think you’re waiting) photos of the bridal gown. 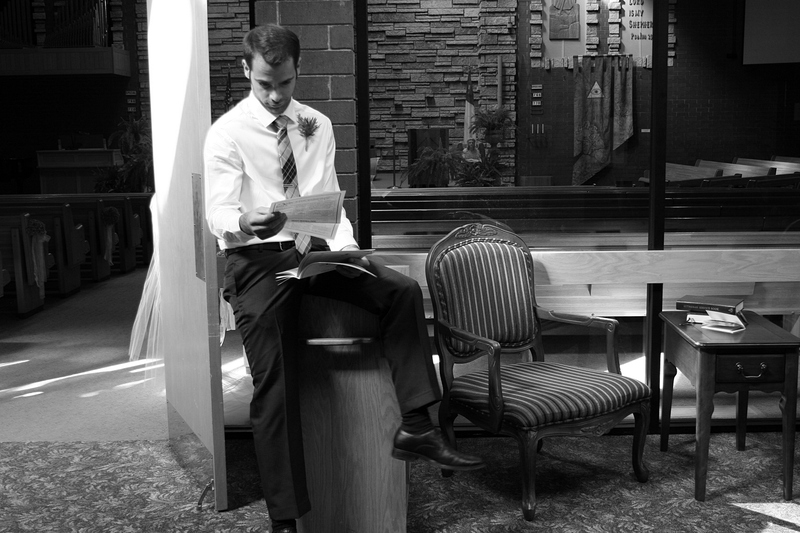 FYI: Click here and here to see the first two posts in this “My daughter’s wedding” series. 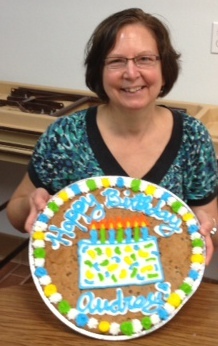 Me with my personalized birthday treat. Photo by Eric Schmidt. IN THE MIDST OF WEDDING preparations, I’d nearly forgotten that my birthday fell four days after my eldest daughter’s nuptials. That would be today, the day I edge another year nearer to 60 than to 50. But my daughter’s new mother-in-law remembered, arriving with a gigantic birthday cookie on Saturday, wedding reception venue set-up day. Lynn is so incredibly thoughtful. She wanted to make sure I was remembered in all the busyness of wedding planning and prep. How sweet. The other sweet thing is that the cookie was inscribed with “Happy Birthday Audrey!” I can’t recall ever having my name written on a birthday treat. Ever. To be remembered like this, to have my family and my girl’s new family pause in reception set-up and sing Happy Birthday as my now son-in-law carried the personalized birthday cookie to me touched me deeply as did the photographs taken of me. It is wonderful to feel so loved and cherished. 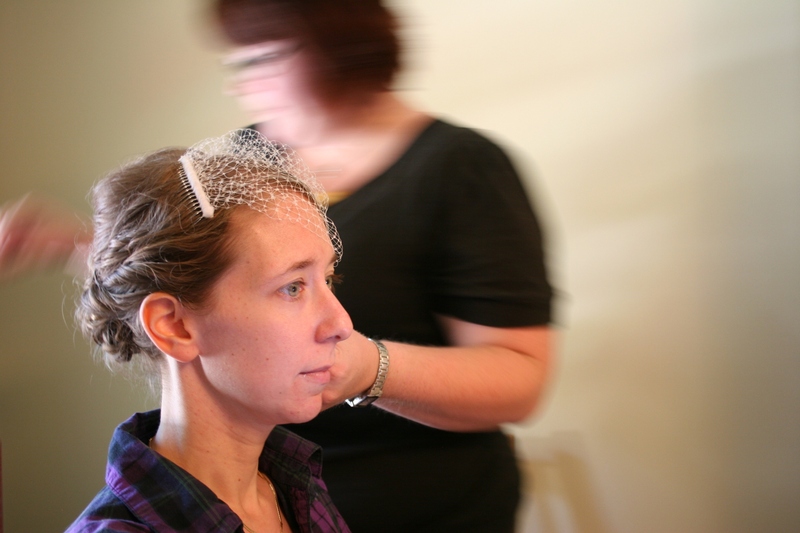 I REALLY WANTED TO BE THERE, to photograph my daughter, the bride-to-be, as she was getting her hair done on the morning of her Sunday, September 22, wedding. But I couldn’t be in two places at one time. Setting up the rest of the reception venue, the part that couldn’t be done until the last minute, took top priority. 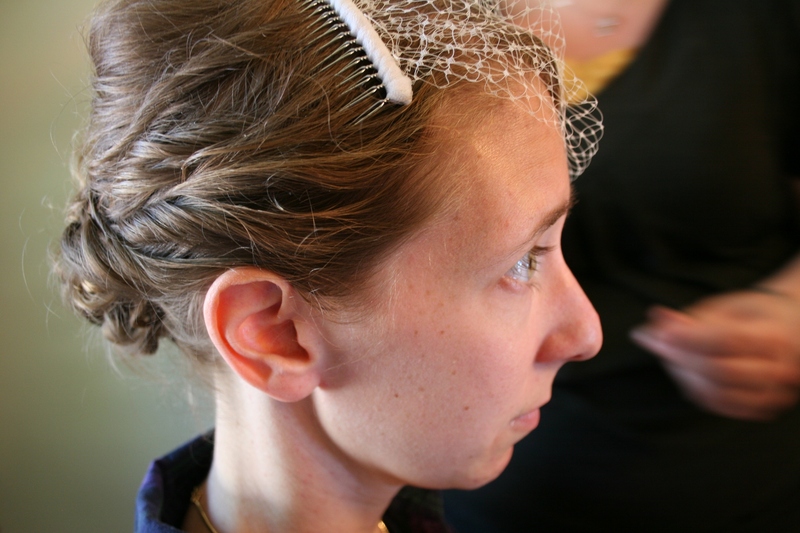 Thankfully, though, Amber’s bridal veil had not been put in place before I returned home to prepare lunch for the bridesmaids and personal attendants and the groom’s sister-in-law and my own family. I’d made barbecued pulled pork days earlier, had fruit cut up the evening before, cookies baked and only needed to throw together a lettuce salad at the last minute. My wonderful husband, Randy, assisted, easing the stress. 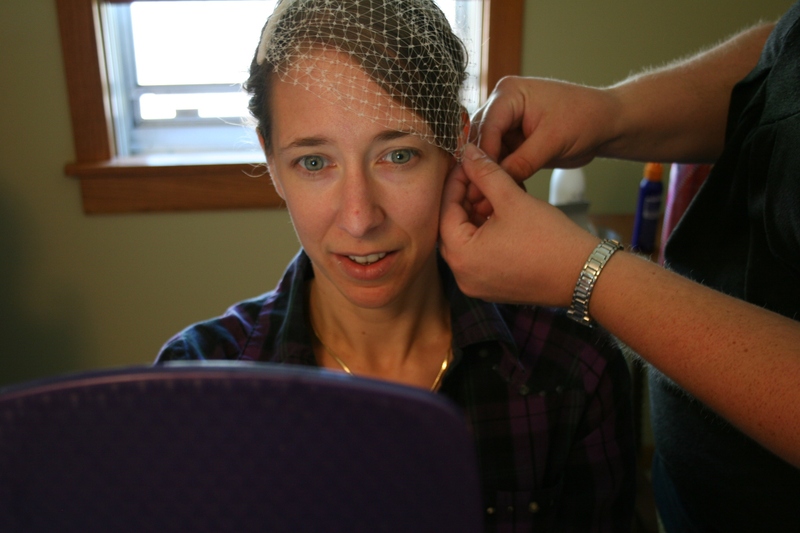 The first fitting of the veil. My daughter is used to me moving in close with my camera. 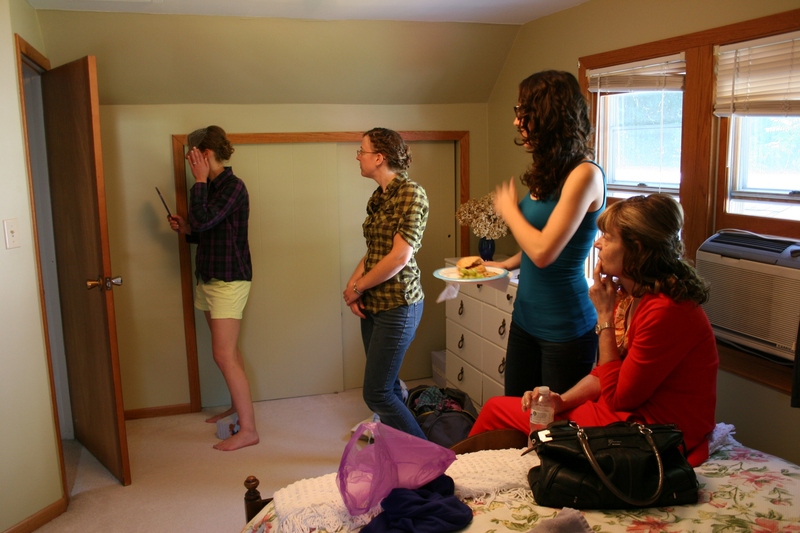 As Alli, the professional hair stylist and a former classmate of Amber’s, angled the veil into position and then secured it, I literally got in my daughter’s face to photograph these moments in the upstairs bedroom she once shared with her sister and maid-of-honor, Miranda. The bride, Amber, checks out the veil placement as her sister Miranda, left to right, future sister-in-law Stephani and mother-of-the-groom, Lynn, watch. It was an emotional moment for me, for all of us in the room—Miranda and Amber and the groom’s mother, Lynn, and the groom’s sister-in-law, Stephani. And Alli, too. 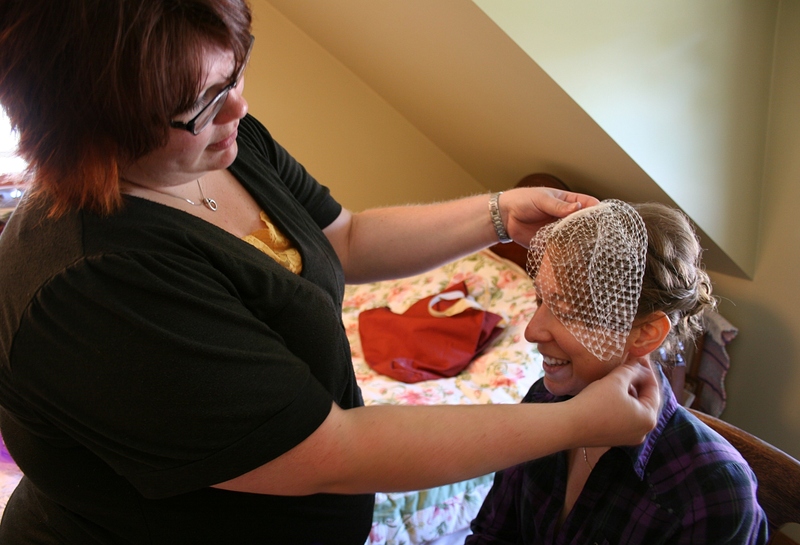 Alli works the veil in to place. Alli works her magic on Amber. Probably my favorite photo for the light and the serene look on the bride’s face. We could feel it. We could see it. We could hear it. Pure happiness in the bride’s face, in her eyes, in her grateful words. 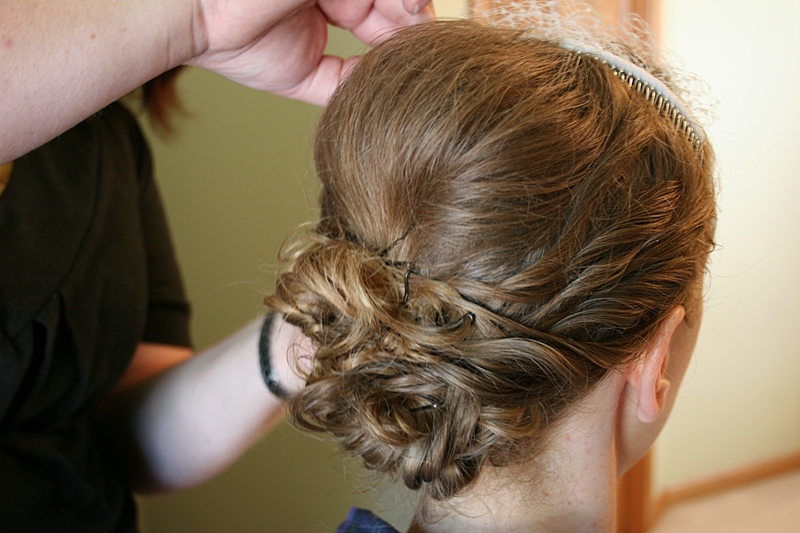 The lovely back of the bride’s hair do. And later, after the others were done with their hair and lunch and most of them gone, and Alli was about to leave, I asked if she could do my hair. Last minute. So she pulled her tools from a cloth bag, plugged in the curling iron and I sat on the bathroom stool as she curled my hair. Then, an hour before leaving for the wedding, I finally had time to sit down and polish my fingernails. Last minute, before slipping into my dress and heels for my eldest daughter’s wedding. 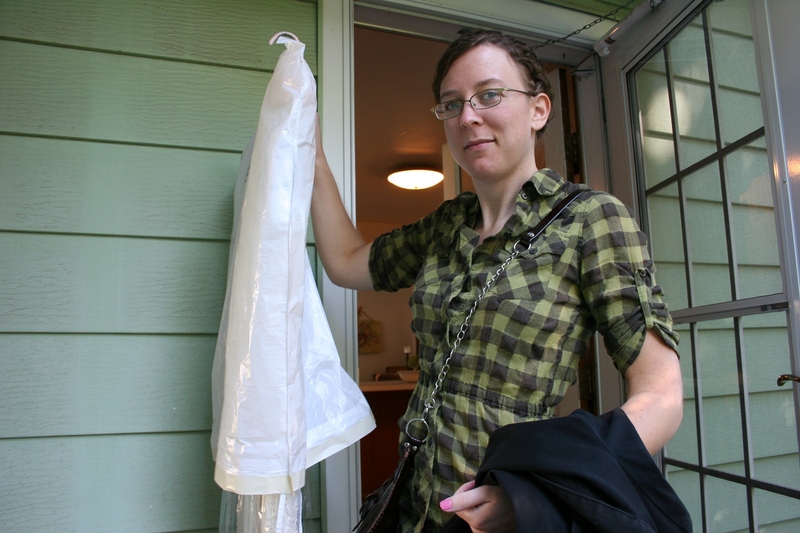 The maid-of-honor, my daughter Miranda, carries her sister’s wedding gown to her car. 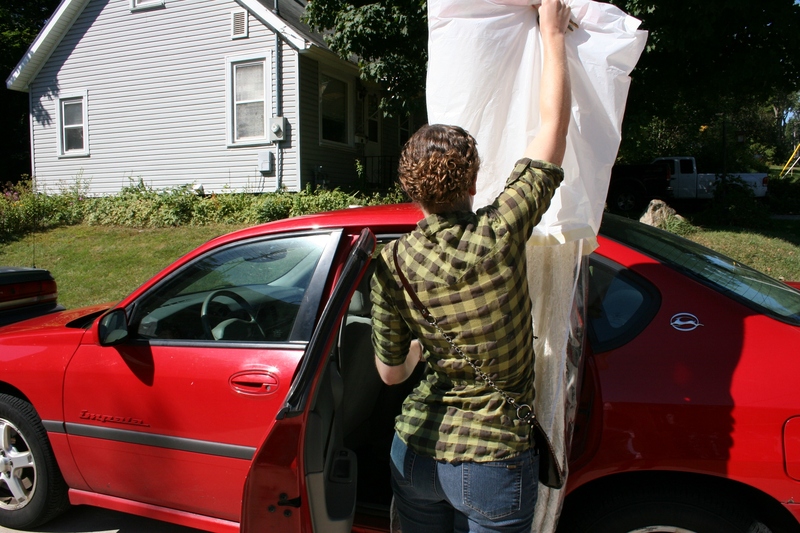 Miranda carefully lifts the beaded replica vintage bridal gown for placement inside her car. Look at the incredible “do” Alli created with Miranda’s curly hair. Alli said it’s her favorite style of any she’s ever done. The sisters, my daughters, load wedding item necessities and Amber’s belongings into the car. They joked about their plaid shirts. 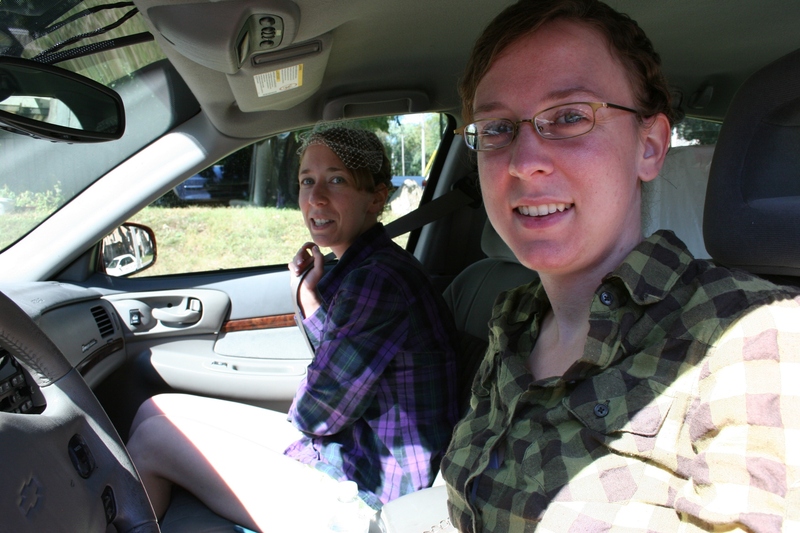 The sisters buckle up and pose for one last photo before driving to church. I would see them two hours later, per the bride and groom’s request that the parents stay clear of the church until family photo time. CLICK HERE TO READ my first wedding post. Please check back for more wedding photos. LONG BEFORE THE WEDDING, the preparations begin. Church, reception venue, caterer and floral designer booked. Check. Dresses and dress shirts and other wedding attire selected and purchased. Check. It takes hours and hours and hours, more than I ever imagined, to pull off a wedding. It takes families working together and patience and love and endurance. It takes trusting in others and prayer and encouragement and support and focus. All of this I’ve learned. My eldest daughter’s wedding day on Sunday was near perfect from the weather to the pastor’s message to the ceremony to the toasts to the food to the venue to the flowers and everything in between. There were only a few minor flaws, like running out of paper towels and a key that wouldn’t work for the supply room; two wedding party crashers who wandered in off the street and were about to help themselves to dessert before being escorted out; and an usher (the bride’s brother) who was in a Massachusetts hospital emergency room eight days before the wedding with an asthma attack and a severe viral infection (lots of people praying for his recovery; he was healed by wedding day). Now, days after the wedding, I am sorting through photos and reflecting on everything, feeling blessed beyond measure that my daughter, Amber, has found the love of her life in Marc. Anyone who has seen the two of them together can see their deep love for one another. They are blessed. And so is this new mother-in-law. Blessed beyond measure. 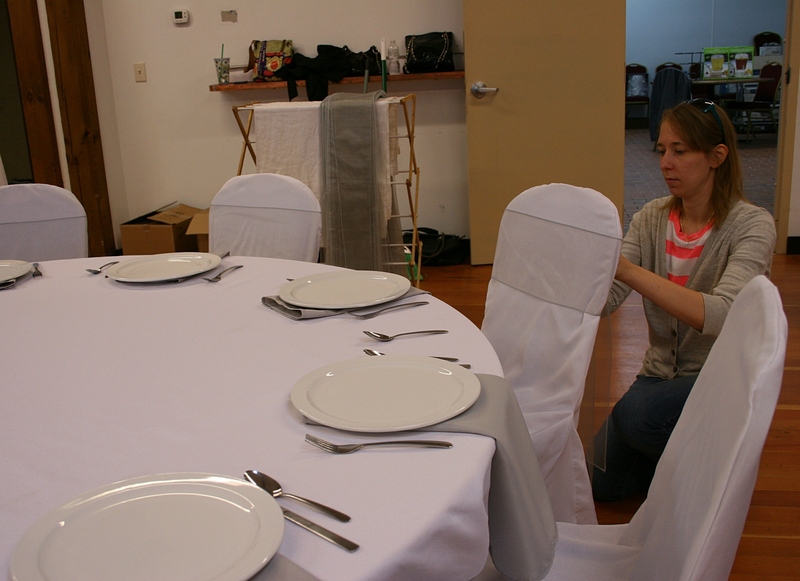 TODAY I BRING YOU the first in a series of wedding posts, this one focusing on wedding reception venue prep and images. 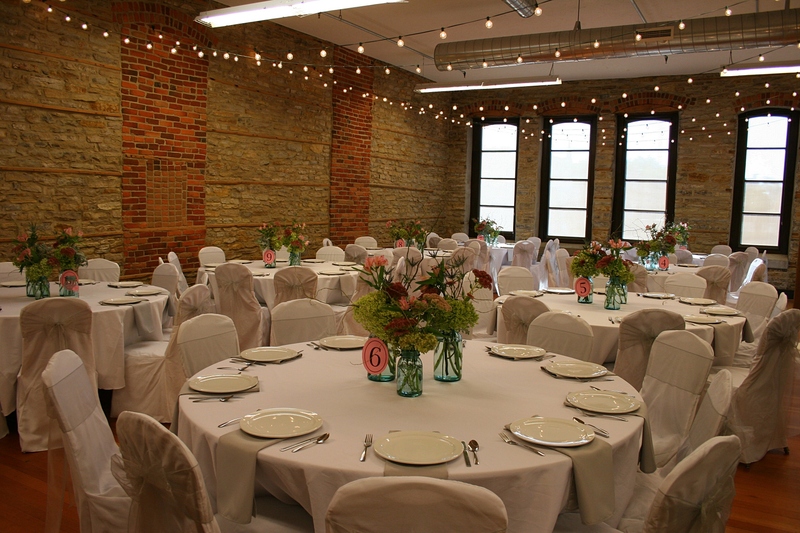 Enjoy this peek inside, in my opinion, one of Faribault’s most beautiful reception spaces, The Loft in the historic Bachrach Building along Central Avenue in downtown Faribault. 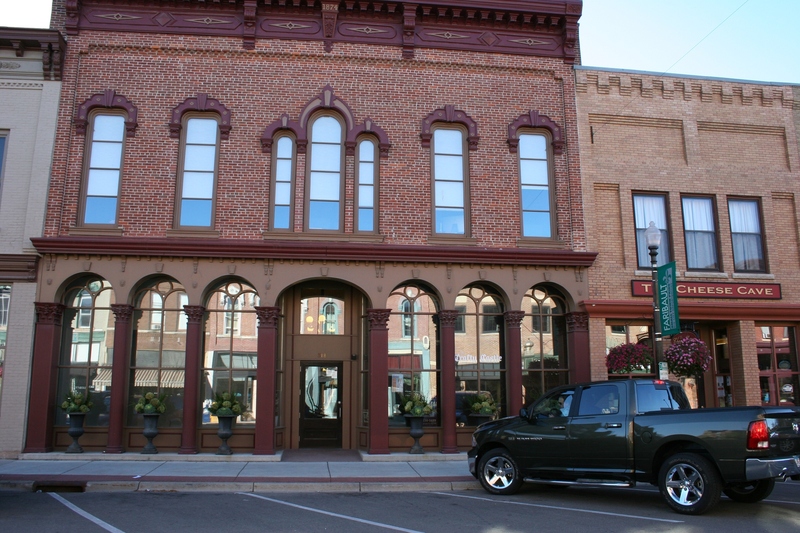 The Bachrach Building in downtown Faribault was beautifully restored several years ago to its original appearance. The Loft space is on the second floor in the back half of the building. 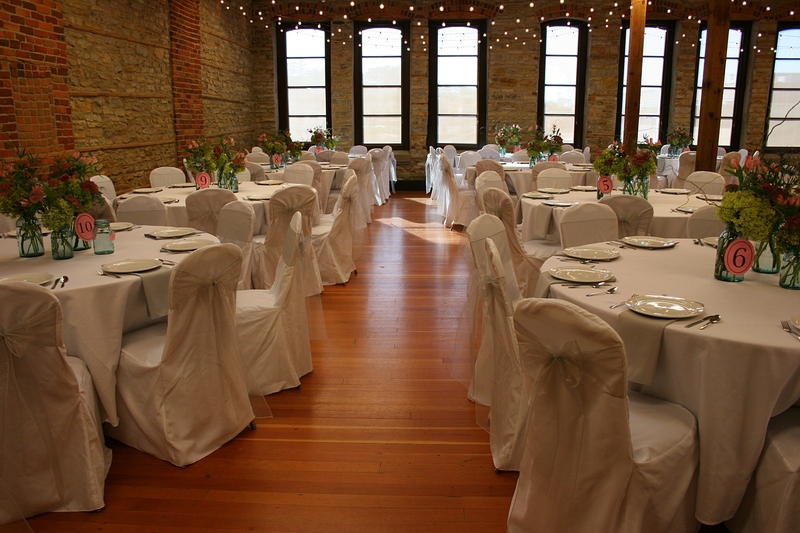 It features exposed brick and limestone, wood floors and a bank of western windows. Great space with exceptional natural light. 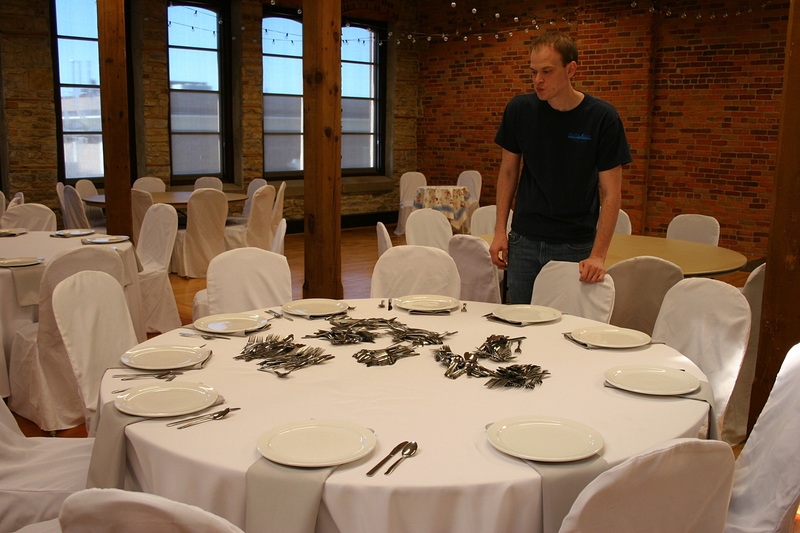 The bride’s brother, Caleb, steam presses tablecloths while the father-of-the-groom, Eric, places napkins on tables. 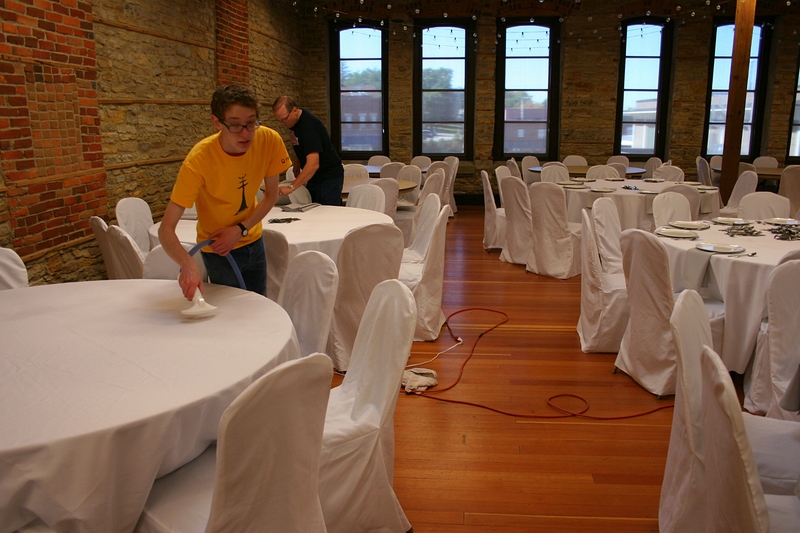 The groom, Marc, worked just as hard as everyone else to transform The Loft. The bride assumed sash tying duties. Only 115 sashes to tie. 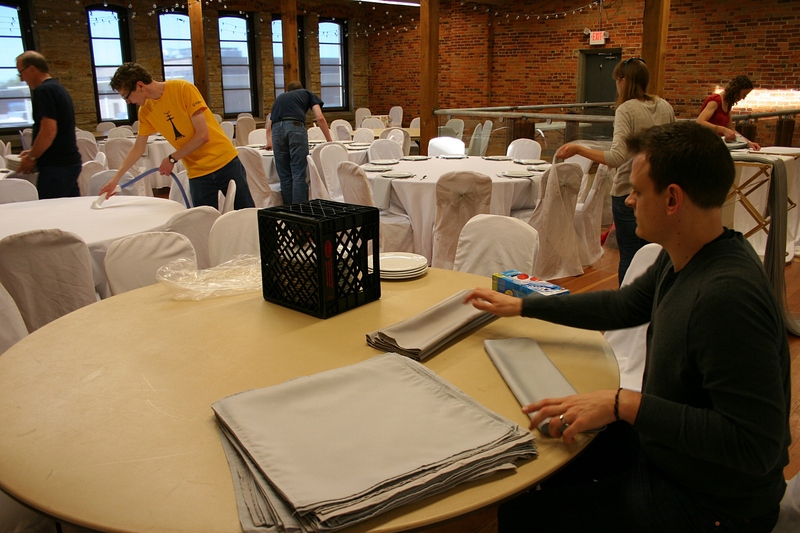 Best man and brother of the groom, Jon Eric, folds napkins. The ironing crew, from left, maid-of-honor Miranda (the bride’s sister), Lynn (mother of the groom) and Stephani (sister-in-law of the groom and reader). Ironing was, by far, the biggest and longest task. 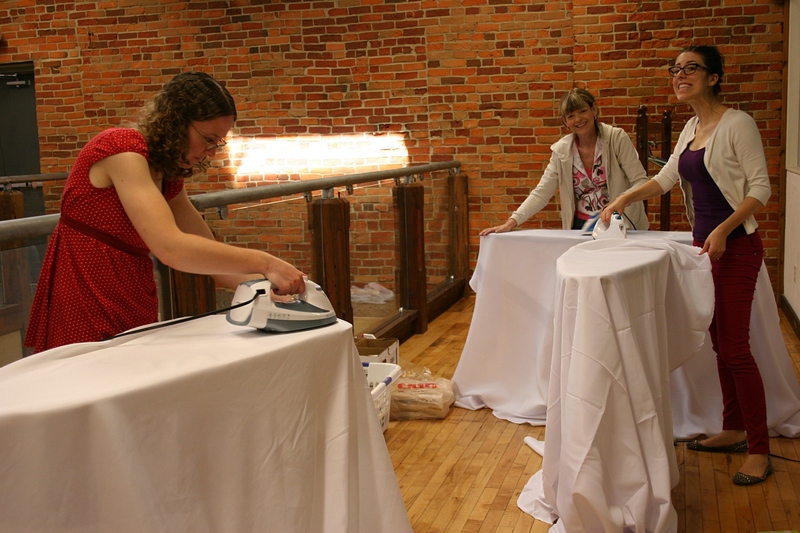 I ironed all of the sashes and napkins prior to set up day, so did little ironing of tablecloths. The Helbling and Schmidt families working together. The father-of-the-bride, my dear husband, swept the downstairs Atrium area used for the social hour. He also vacuumed the stairs and other carpet, wisely avoiding any ironing or sash tying duties. 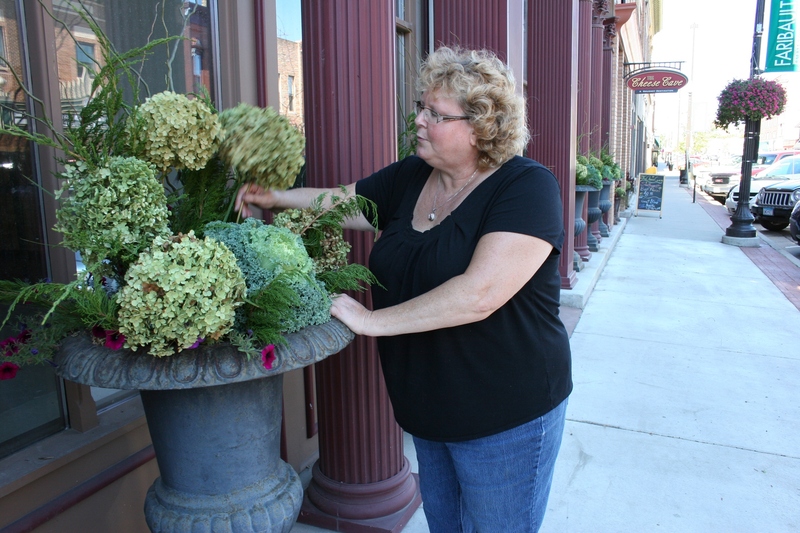 Outside, my floral designer sister, Lanae of Waseca Floral, fills urns with hydrangea from my yard and with ornamental kale and curly willow and greens from her yard. She is one talented floral designer and the BEST sister ever. The floral designs my sister created outside the Bachrach Building and still in place. 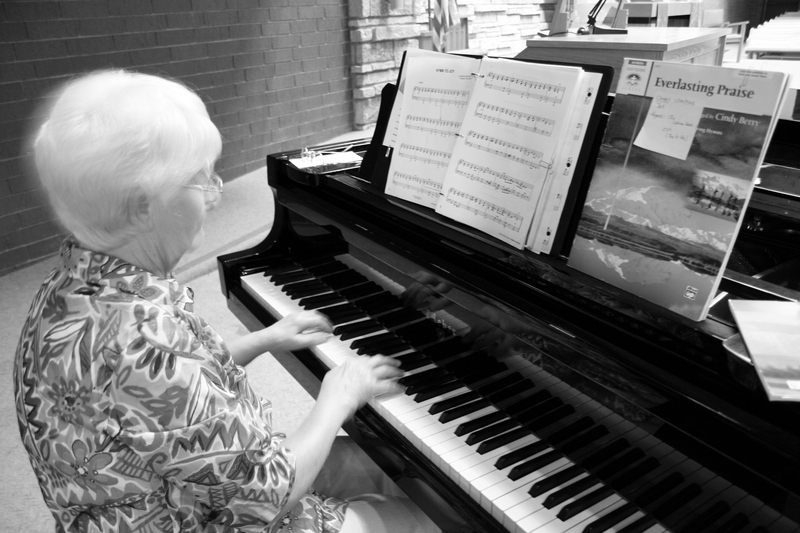 If you like what you see, go to the “About Us” page on the Waseca Floral website and send her an email. 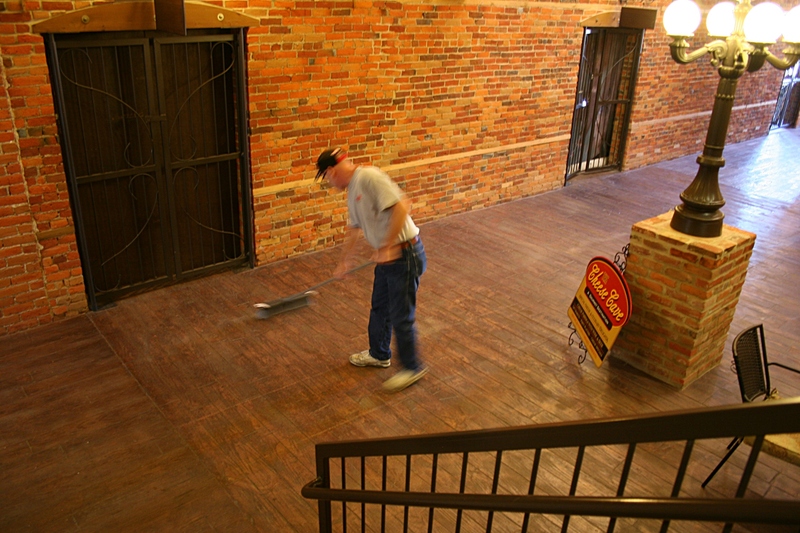 The first floor Atrium in set-up process. 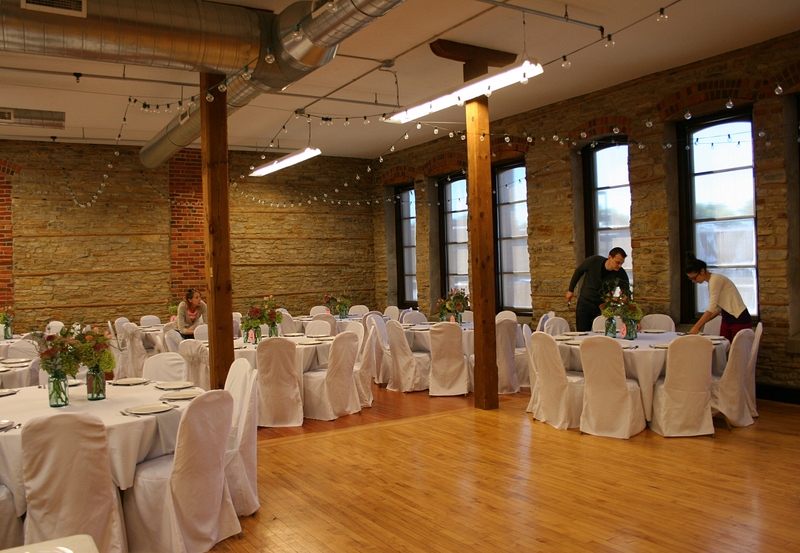 The table to the left held Faribault made cheeses purchased at The Cheese Cave which is just off this room to the right. Looking down from The Loft into The Atrium. My husband, Randy, and I set up this area Sunday morning. Missing from this photo are a vintage suitcase used for cards and set on the gift table, to the left. Back upstairs, work continues on the reception set up. After hours of teamwork…it all comes together. 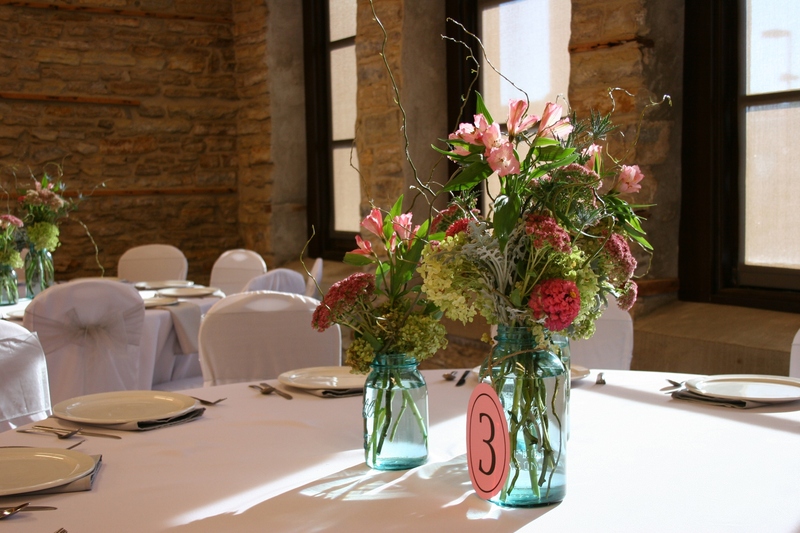 My floral designer sister, Lanae of Waseca Floral, created these stunning centerpieces using mostly flowers from her garden and that of her friend and co-worker, Carol. The flowers were perfect. The vintage blue Ball canning jars were rented from Mike, who lives two blocks from me. I stopped at his garage sale this summer, saw the jars and learned about his jar rental. 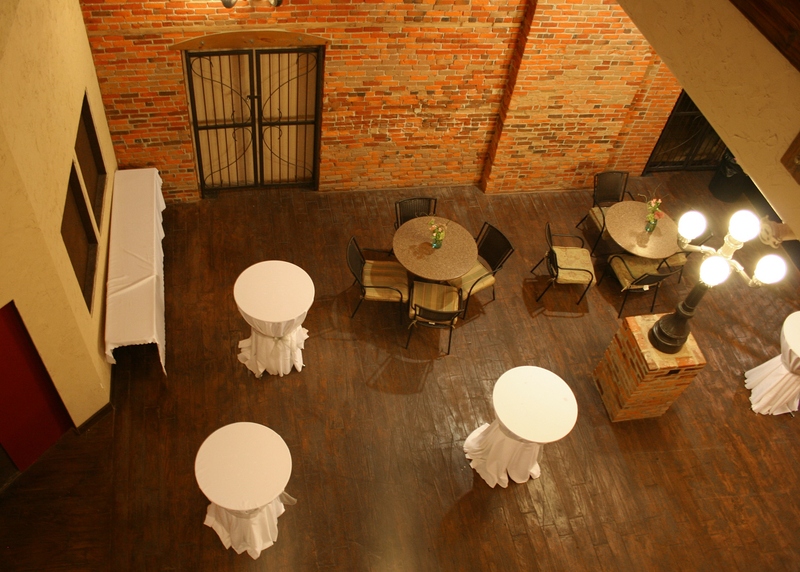 Just another view of the beautiful The Loft space on the upper level of the historic Bachrach Building. A “sweetheart table” just for the bride and groom. It’s covered in one of the vintage tablecloths from my collection. 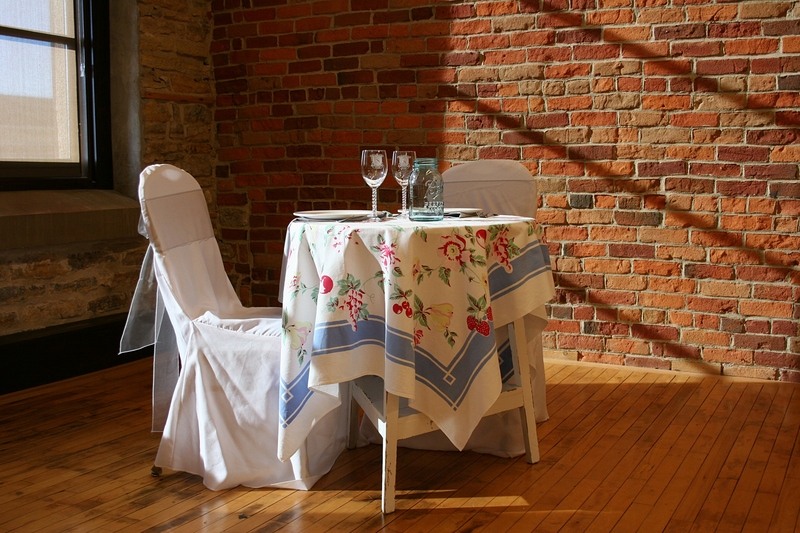 The table was purchased for $15 months ago at a Montgomery, Minnesota, used furniture store. At the time of purchase, my husband asked why I was buying it. “Because I like it,” I told him then. Little did we know our daughter would use it at her wedding reception. 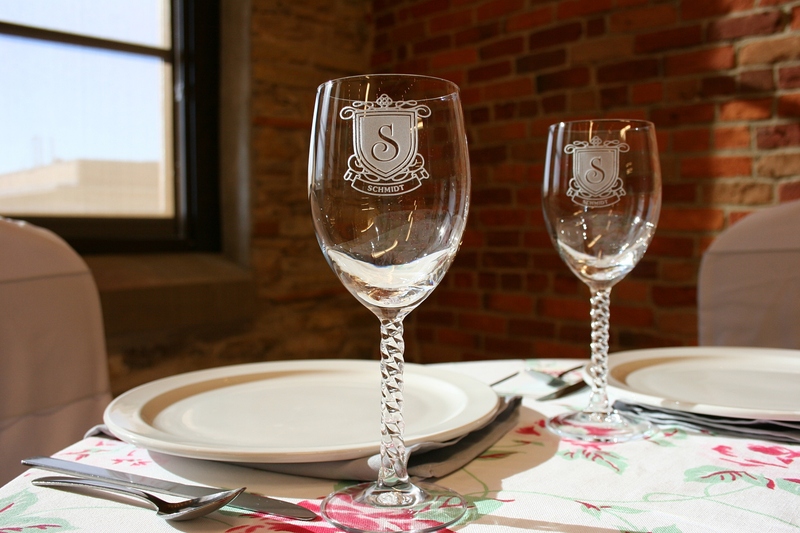 Vintage wine glasses, gifted by the groom’s grandparents, Herb and Norma. The Schmidts flew in from the groom’s native California for the wedding. Other of the groom’s family flew in from places like New Jersey, Pennsylvania and Mississippi. 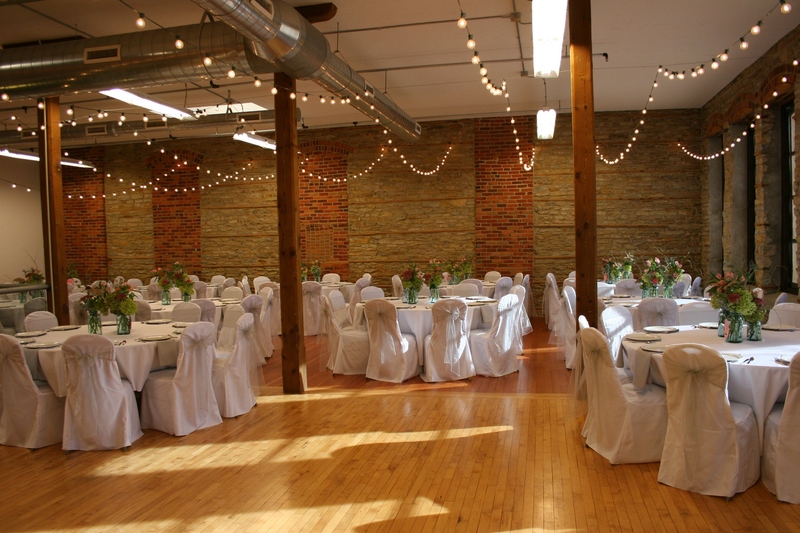 One last view of the reception venue with a space left open for the dance floor. 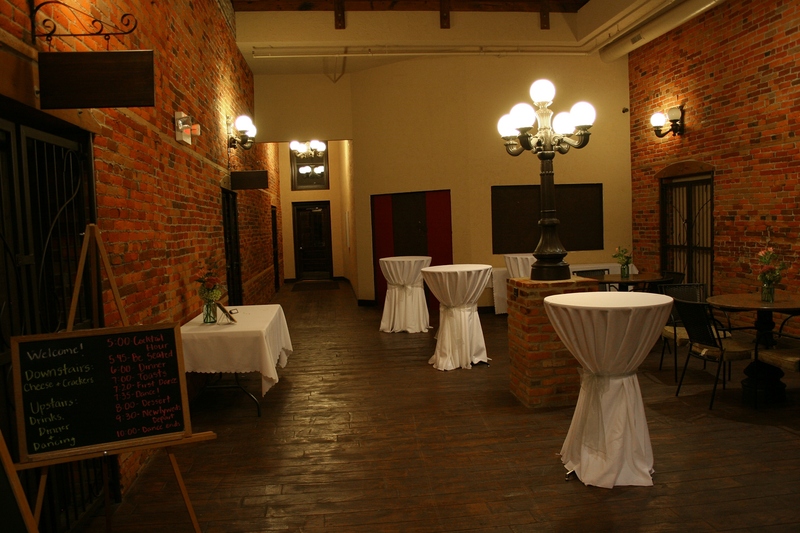 By around 5 p.m. Saturday, The Loft was ready for guests to arrive 24 hours later. Thank you, Schmidt family and my family and sister Lanae for all of your hard work in creating a beautiful reception setting. MORE PHOTOS TO COME, dear readers. But for now, this mother-of-the-bride is too exhausted to choose and edit images. In synopsis: The wedding ceremony was beautiful, the bride gorgeous, the groom beaming, the venue elegant, the food outstanding and the celebration with family and friends absolutely the best.